Gais! Gais! OMGOMGOMG! A new episode of the Virtual Skeptics is up and you HAVE to see it! Adapted from my segment on Virtual Skeptics. That’s Virtual Skeptics, available now for all your skeptical needs on YouTube or virtualskeptics.com. Last week, Karen L. King, the Hollis Professor of Divinity at Harvard Divinity School, dropped a bombshell at the tenth annual International Congress of Coptic Studies in Rome: she had found Mrs Jesus. Oh. My. Married. God! The Da Vinci Code was right! Hang on a sec. First, The Da Vinci Code was not right. Not in any world. Jesus and Mrs. Jesus, YHWH and Asherah, Buddha and Buddhessa, the Vishnus, Zeus and Hera, Odin and Frigg could all come down from on high and proclaim in a variety of languages that The Da Vinci Code was right, but that still wouldn’t make it right: it would just prove that those gods are fallible and unworthy of worship. Such a declaration would immediately remove a god from the God Stakes. The provenance of the fragment is murky at best. The owner has chosen to remain anonymous, although he or she apparently also owns a 2nd- to 4th-century fragment of the Gospel of John in Coptic. This fragment came from the same batch of Coptic and Greek papyri as the “Take my wife” fragment (King 2). Where these fragments came from originally, no one knows. The anonymity of the owner and the murkiness of the provenance raise concerns that the fragment could have come from the illicit antiquities trade. King makes several arguments in favor of the fragment’s authenticity. She notes that the papyrus seems to be genuinely old but admits that it is possible to acquire blank scraps of ancient papyrus. However, she believes that the condition of the ink argues for authenticity: it is badly worn and in some places illegible. The “verso” is particularly badly damaged, with only a few recoverable words. There are also minute traces of ink at the edges of the fragment, suggesting that the text was cut off from a larger original. Where the papyrus is damaged, the ink has faded or disappeared. King argues that if the fragment were a modern forgery on old papyrus, we would expect to see the damaged areas filled with ink. The ink will be subjected to non-destructive tests. These will not provide a definitive date but should show if the ink is consistent with that of other ancient papyri. A more definitive test, such as Carbon 14, cannot be used because that would destroy too much of the tiny fragment. 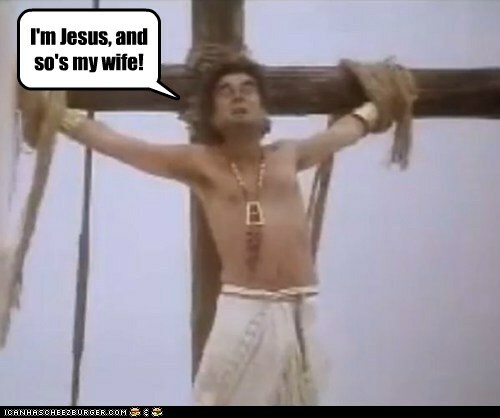 On the other hand, the references to “my wife,” “Mary” and a female apostle seem almost too good to be true. It’s not just Da Vinci Code fans who are hungry for this kind of evidence. Perfectly normal, literate people have become interested in the gnostic gospels that suggest the crucial role women played in some sects of the early church. References to an intimate if not necessarily sexual relationship between Jesus and Mary have sparked a great deal of interest among feminist bible scholars and Christian women. And, boy howdy! this tiny, tiny fragment hits all the sweet spots, without containing a single complete sentence. *** Several other religious artifacts that seemed to good to be true, such as the James ossuary and the Jordan lead codices, were rather quickly declared likely forgeries. The Gosple of Jesus’s Old Lady appears to be headed in the same direction. In the peer review of King’s article, two of the three readers questioned the fragment’s authenticity, and King’s article shows that there are anomalies, such as non-standard grammatical forms. King defends these by reference to the Gospel of Thomas, but its similarity to that text may be problematic. Within days of the momentous announcement, New Testament scholar Francis B. Watson of Durham University argued that the Gospel of Jesus’s Main Squeeze was cobbled together from bits and pieces of the Coptic Gospel of Thomas. While he makes a compelling case, it is difficult to judge, without knowing Coptic, whether the similarities result from a modern forger lifting scraps from Thomas, or whether, perhaps, the two works merely share verbal parallels. So, it seems King’s announcement may have been premature, but she notes that she was looking for comment and criticism. In the draft of her article, she freely mentions the reservations of her readers. The media reaction to her announcement, however, has been predictable. Headlines scream that there is new evidence that Jesus had a wife or that King claims Jesus was married. Neither of these statements is true. It is well-known that early Christians held widely diverse views, even about Jesus’s nature (was he fully divine, fully human, or both?). The fragment doesn’t provide evidence that Jesus had a wife; if it is authentic, it merely provides evidence that some early Christians thought he had a wife, a view that doesn’t come as much of a surprise to scholars who study the early church. This fragment is little more than another attempt to discredit Jesus and hence Christianity. Any impeachment upon Jesus’ character would be fuel to the devil which if this parchment were true would have been evident by now the devil would not have let an opportunity like that go begging. You [another commenter] blaspheme when you say that He was “kissing on Mary all the time” not only is that not scriptural but it defames His character. For Jesus to have a wife is to suggest that there was a passion within His nature which His Deity could not overcome thus diminishing His ability to overcome for the world. He would not have had the desires of a human in this regard because He came to do the will of the Father which was to live a pure and sinless life and die as God’s sacrifice for sin to atone for the sins of the world. *The Coptic word can mean either “woman” or “wife;” the use of the possessive suggests that “wife” is the more appropriate reading. **Stop laughing, Brian and Bob. You’re adult men with beards–it’s not that funny. ***This isn’t entirely fair. There are a couple of complete independent clauses (e.g., “Mary is [or is not] worthy of it”). They may or may not be complete sentences, but they aren’t complete thoughts.